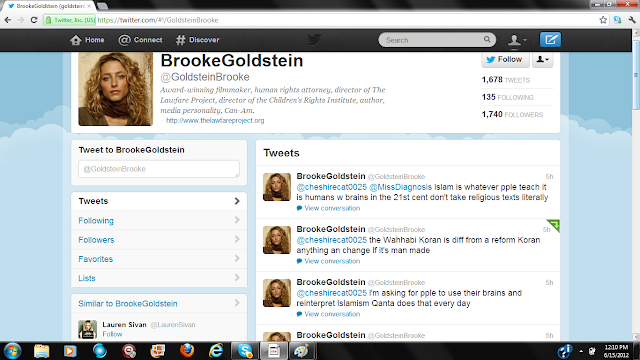 Gaffney’s Gal Goldstein: “Reform Koran”, Where Does She Come up With This Stuff?! As Islam continues to gain a foothold in America, we unfortunately see so called leaders in this war continue to spread false hope and blatant misinformation. 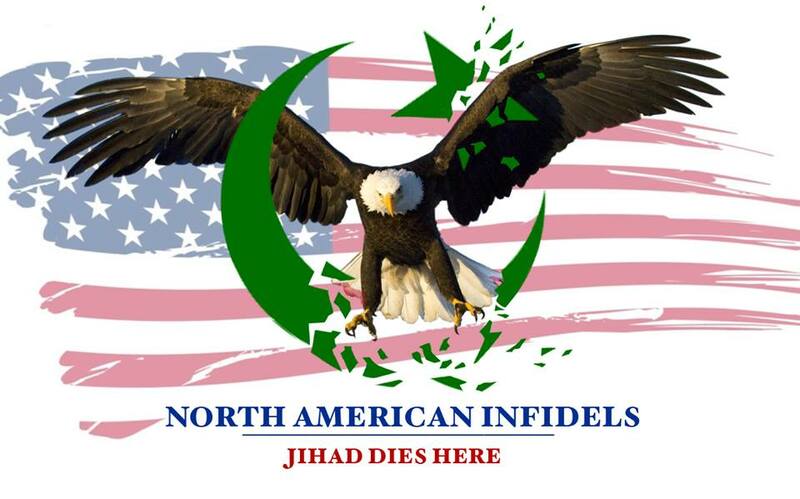 Several months ago we saw the Queen of False Hope Brigitte Gabriel, state that so called “moderate” Muslim Zudhi Jasser “truly” represents Muslims in America. Yet her or Jasser cannot even name ONE Mosque that is promoting his views. 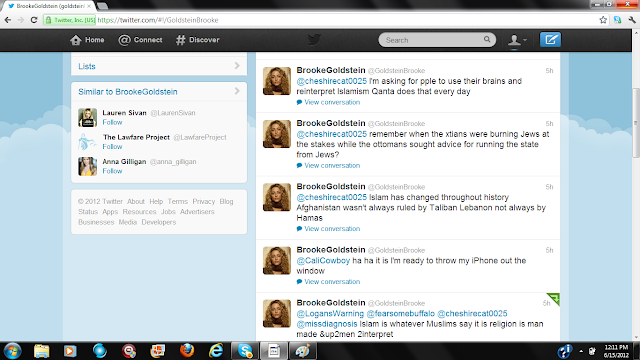 Today we take a look at Brooke Goldstein, another woman who stands in Frank Gaffney’s Islam will reform, “moderates” are coming to the rescue fantasy camp. Must be like a fantasy baseball camp…. I am not going to say that she has done nothing good on this issue, but promoting the “moderate” Islam fantasy, is the equivalent of hammering a nail into the coffin of Lady America. It is not happening. Recently I had spoken to Brooke on Twitter, and it seems the woman has done little to no research on the Islamic scriptures. Her statements on Islam are outrageous! I asked Brooke to explain how infidels promoting so called Muslims is going to get the Islamic commnunity to follow them. She had no answer. I am sure her statement of Islam being man-made will go over well across the Islamic community. I am sure Muslims are running to side with her. Is this the best the no real answers Gaffney camp can do? I and many others do lay their lives on the line Brooke, and you doing so does not excuse the ridiculous message your are sending to America. You cannot even back up your argument with any evidence that Jasser is changing history. That is why you ran from the conversation. Are you kidding me?! Western governments have pratically been begging Muslims to change their agenda of world dominance. I hate to say it, but reality is not your strong point. Hamas does NOT run Lebanon. @cheshirecat0025 remember when the xtians were burning Jews at the stakes while the ottomans sought advice for running the state from Jews? What makes you even begin to to think the Muslim community cares what you think? Do you really think they will stand with what you want over Islam? Talk about delusions of grandeur. I have to laugh Brooke. I’m just positive that statement will be homerun across the Middle East! Finally you will get a look at Brooke’s most ridiculous comment. Is that so Brooke? Did Mohammad also have a different one? Please educate me. I asked her to produce a copy of this so called “reform” Koran, and to name just one major school or Mosque that suppports it. That’s when she turned in to the female version of Houdini. Is she blatantly lying to America, telling people what they want to hear? Or did someone feed her the misinformation? Was it Gaffney, Pipes, or maybe even Jasser himself? With people like Brooke leading the way we will surely lose this war. Brooke has been invited to brief government officials at the U.S. State Department, the White House, the UK Parliament, and at U.S. Central Command Seminars, and she has visited U.S. military schools and conferences to speak on issues of asymmetric warfare and human rights. Until the “leaders” of America accept the fact that Islam itself is the problem and it is not reforming, we will continue to lose this war. Camp Gaffney has failed America. ← 1000 Police Raid Muslim Residences Across Germany! I wouldn’t mind if she was just some clueless valley girl. Lord knows there will always be those types yammering their clueless nonsense. But she’s a speaker to people in positions to influence events and she has no idea what Islam is all about. Heaven help us. Exactly! That’s why this had to be written. I sent it to her and Gaffney. Let’s see if they respond. Wow, she is completely clueless about Islam. If she had even a slight clue, she would know enough to be embarrassed about it. Hey Miss Clueless Pollyanna. Many of us do! This statement convinces me that Brooke is either a clueless atheist or a victim of whatever progressive religion she believes in. She is incapable of grasping the reality that people can believe with their whole heart, soul, and mind that Scripture can be literally interpreted, whether Islamic, Christian or voodoo. She has a very Brooke-centric view of the world: Just because she can’t believe she believes no one else can. That is a mental illness. Looking for a Reform Koran is a fool’s errand, but Brooke Goldstein is an attorney,not a religious scholar. We need to judge her on her competencies, not an impulsive tweet. Ms. Goldstein is the co-author of “Lawfare – the war against free speech.” This book is an excellent guide for pundits and bloggers on how to avoid lawsuits and how to defend themselves against SLAPP actions (Strategic Litigation Against Public Participation). Unfortunately it was not an impulsive Tweet. She has returned to Twitter pissed off, and is sticking with her reform position. Like Chief said, she cannot answer the questions. Chris, there’s religious points to be made, perhaps, but Brooke and Frank Gaffney don’t deserve such harsh treatment. They really don’t. Both are loyal Americans working hard to save US from attacks by the OIC, etc. They’re on the front line of those saving our freedoms. They do know the score. I would, therefore, debate the issue, not the people, especially with a sexist headline that’s inappropriate. Besides, all three of you are my heroes for the work you do. Brooke and Arron’s Lawfare, mentioned by someone previously in the comments. Robert examines past scholarship on the issues of the validity of Muhammad and the Koran and it appears both could well have been constructs of the Saudis in their early conquests to retain power over the people and expand empire. Not that Islamists would run out and buy into that concept and modify the Koran and hadiths to account for Saudi influence, but they should! Even Robert doesn’t think they will, but at least he has exposed what they have likely done. Their religion and prophets are frauds, constructs! p.s. These countries should beware of the Saudis. They are led by the nose. I hope you read the book and comment on it, as the title’s deceiving, it is much more than Mohammad. It is a thought provoking look at the Koran, etc. How are you? I have to respectfully disagree with you. Gaffney and Jasser run from the debate on this, and it is clear that Brooke knows little to nothing about Islam itself. They are blatantly misleading Americans into believing that some form of a non-Muslim friendly version of Islam is coming down the pike. It is not coming, and things have only gotten worse under Team Gaffneys watch. Pipes has been pushing the same nonsense for at least a dozen years. It is not working, but apparently their egos are two big to admit they are wrong. If we do not deal with Islam and Muslim immigration head on we will eventually lose this war. Islam itself is the enemy. They are afraid to name the enemy. Hi Christopher, doing ok, thanks. Staying inside to stay cool! I’m not up on this new version of Islam. But these folks have done much good! It doesn’t seem like it’s all bad to support moderates, or if you prefer, those who do not adhere to the strict interpretations of Islam. What would you do differently? Is this what you’re speaking of? Pipes has spoken out often against the OBama regime’s not naming the enemy. I wonder if they believe this vocabulary thing will prevent the radicalization of second gen immigrants here or they really want to bring the US down. It is the Communist Left in control, after all. You are falling into the trap. There is no new version of Islam. The Koran (10:64) says its words cannot be changed, and the Edip the fake reformer took it even further and left words out. Besides that he cannot even name one Mosque that uses his book. It is just a smokescreen while Islam continues to gain a foothold in America. Promoting “reformers” lulls Americans into believing the problem will resolve itself. That some form of “moderate” Islam is going to save the day. It did not happening in Europe and it will not happen here. The message is dangerous, and Jasser is a master of it. Ask yourself why these so called reformers continually seek out non-Muslim audiences? Like Edip, Jasser and his supporters cannot even name ONE Mosque that supports his him. It is a complete waste of time to support them. Should we have looked for a moderate version of Nazism? Of course not. This is a war, and Islam and Muslim immigration need to be dealt with head on. Not another one of them should be allowed to come into our great country. You know what Muslim immigration has brought to Europe. Well the same has started here. If non-Islamic countries do not end Muslim immigration, it is just a matter of time until we lose this war. As for the “reformers”, let them go reform Islam somewhere else. I am not willing to gamble America on them. Look at these comments to see the true ugly colors of Edip, the translator of the fake Koran which is still full of hatred. How I wish she was just a clueless valley girl. Is this gal for real. You can buy a Koran and Traveller’s anywhere for a song. What is she reading? Romantic novels. 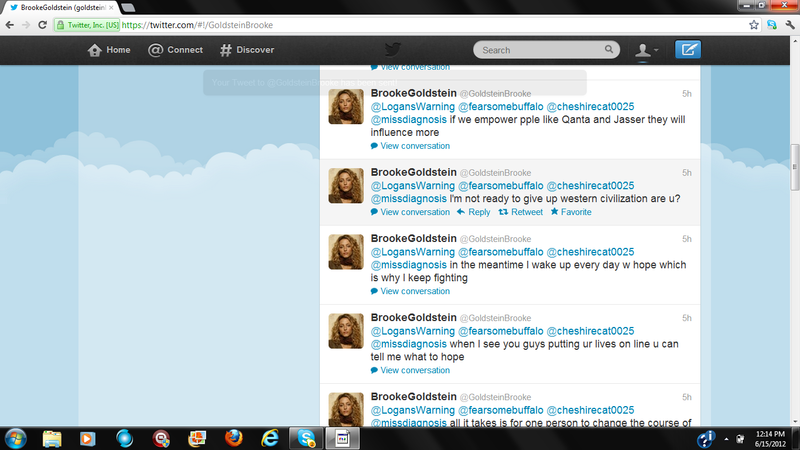 I am just plain mad and disgusted that these clueless valley girls find their way into influence. Literally God help us. Why can’t some so-called moderate Muslims understand that you can’t reform evil? For example, if Muslim historical documents state that all women are second class citizens, an evil, how can Muslims reform that Islamic doctrine? The only way to reform this evil is to dump it and teach that all women are also first class like the men. This holds true with all the other evil Islamic doctrine. You dump them, chuck them, or just flush them down the toilet, and choose good. Thought about it, and me thinks to have heard, to fight fire with fire. Peace is worth fighting for. Andrew Breitbart and Coroner were murdered to keep Muslim Commander in Chief in power and the looney left and useful idiots serve a purpose before being cast off. This war is huge and needs to be fought by every freedom loving American or we’ll go the way of Eurasia formerly known as Europa. The idiotic left is made up of buffoons that insist on believing their La-la Land myths about how one can pick up a cow patty from “the clean end”. They have no actual contact with reality and when it does slap them in the head…..it’s ignored as “irrelevant” because it doesn’t fit the agenda of “what’s cool today”……or the cause of the moment. The thought that islam in it’s pure form can be anything but evil is not just stupid, but I believe that promoting islam should be considered criminal as in “party to murder”. I had to chuckle Tonto, as I never heard this expression before Yet saddly a very true picture of the looney News Media and Academia. May I reiterate; promoting islam should be considered criminal as in “party to murder and sedition”. Seeing you in the saddle Tonto,please forgive my wandering mis-spelling mind. It is however sad, especially when young enthusiastic and bright minds are ruined by atheistic, looney left Professors at the Universities.